The Kolothu Jetty-bound KSRTC bus arrives at the Kainakari Jetty bus stop at 11.25 am. ALAPPUZHA: The Kolothu Jetty-bound KSRTC bus arrives at the Kainakari Jetty bus stop at 11.25 am. About 25 to 30 passengers, including women and children, get down. Sasidharan Mulamuttom, 65, a lottery seller, alights from the bus carrying some belongings in a plastic carry bag. A folded plastic mat is in his right hand. He wears a saffron dhoti and shirt, a long white handkerchief on his shoulder. “I am returning from the relief camp at Kanichukulangara after 26 days,” he told Express in a feeble voice. The Kainakari Jetty is one of the busiest little towns on the banks of the Pampa in Lower Kuttanad. Passenger boats and country boats pass through the mighty river which flows silently after baring its ferocious nature a month ago. Some volunteers have been removing the destroyed foodgrain from the only supermarket of the Civil Supplies Corporation in the panchayat. A foul smell emanates from the shop and the passers-by have to plug their nose when they come near the store. More than 20 shops functioned in the locality. However, only a stationery shop and cool bar are functioning now. A shop owner showed the watermark of the flood on the walls of the shop to visitors. The village is returning to normal life, trying to forget everything. Shabu of Kaimeedu, Thottuvathala, said the only sole bus service to the jetty resumed on Wednesday after a break of more than one month. “The entire stretch of the road from Pallathuruthy to Kainakari was under water for many weeks. The cleaning is almost complete and the people are reaching their houses from the camps. I am a farmer and I am jobless for the past one month. There is no income to provide for the four-member family. The paddy fields are underwater and our future hangs in the balance,” he said. Kuttanad tahsildar Antony Scaria said the taluk suffered a huge loss due to the flood. “The entire people from 14 villages were shifted to relief camps and as many as 49,500 houses were submerged. In all 153 houses were fully destroyed and 10,366 houses were partially damaged. 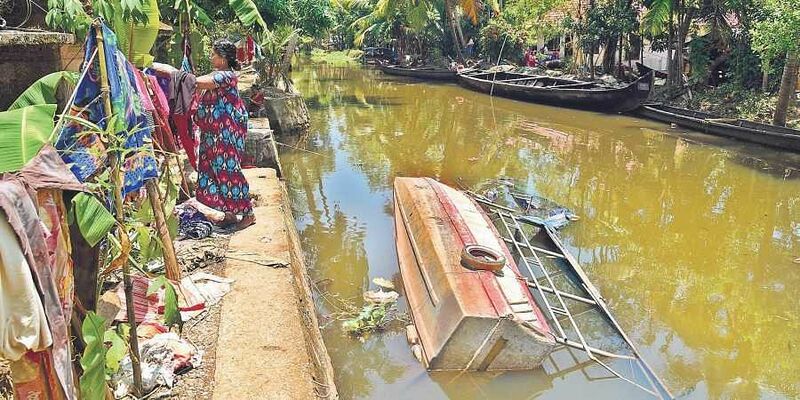 More than 1.90 lakh people were shifted to relief camps in Ambalappuzha, Cherthala and Karthikapally taluks,” he said. Immediate relief of C10,000 was distributed to 40,158 people. The mistakes in account number delayed the distribution to remaining beneficiaries. It will be rectified soon, Kuttanad tahsildar Antony Scaria. Alappuzha: The gushing flood waters devastated the second paddy cultivation in around 10,495 hectares and 630 paddy polders were submerged. However, the farmers have started to drain out water from polders for ‘puncha’ farming which will begin in the October-November period. Principal agriculture officer Beena Natesh said the department is strengthening the outer bunds of paddy polders. “Many outer bunds were breached and motors were destroyed. We have been reconstructing the bunds to begin farming in the coming months. In second term farming, the department suffered a loss of Rs 157 crore. In addition, all infrastructure facilities under the department suffered a loss, touching C290 crore,” she said. The Animal Husbandry Department has also started reconstruction of destroyed cattle sheds and poultry cages.